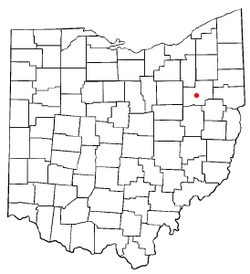 Canton (/ˈkæntən/) is a city in and the county seat of Stark County, Ohio, United States. Canton is located approximately 60 miles (97 km) south of Cleveland and 20 miles (32 km) south of Akron in Northeast Ohio. The city lies on the edge of Ohio's extensive Amish country, particularly in Holmes and Wayne counties to the city's west and southwest. 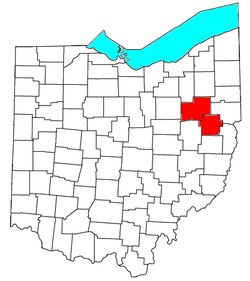 Canton is the largest municipality in the Canton-Massillon, OH Metropolitan Statistical Area, which includes all of Stark and Carroll counties. As of the 2010 Census, the population was 73,007, making Canton eighth among Ohio cities in population. Founded in 1805 alongside the Middle and West Branches of Nimishillen Creek, Canton became a heavy manufacturing center because of its numerous railroad lines. 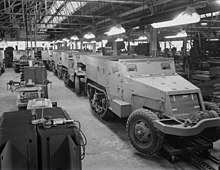 However, its status in that regard began to decline during the late 20th century, as shifts in the manufacturing industry led to the relocation or downsizing of many factories and workers. After this decline, the city's industry diversified into the service economy, including retailing, education, finance and healthcare. Canton is chiefly notable for being the home of the Pro Football Hall of Fame and the birthplace of the National Football League. 25th U.S. President William McKinley conducted the famed front porch campaign, which won him the presidency of the United States in the 1896 election, from his home in Canton. The McKinley National Memorial and the William McKinley Presidential Library and Museum commemorate his life and presidency. Canton was also chosen as the site of the First Ladies National Historic Site largely in honor of his wife, Ida Saxton McKinley. Canton is currently experiencing an urban renaissance, anchored by its growing and thriving arts district centrally located in the downtown area. Several historic buildings have been rehabilitated and converted into upscale lofts, attracting thousands of new downtown residents into the city. Furthering this downtown development, in June 2016, Canton became one of the first cities in Ohio to allow the open consumption of alcoholic beverages in a "designated outdoor refreshment area" pursuant to a state law enacted in 2015 (Sub. H.B. No. 47). 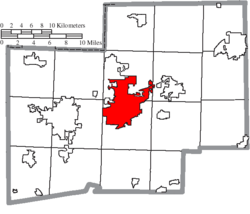 Canton was founded in 1805, incorporated as a village in 1822, and re-incorporated as a city in 1838. The plat of Canton was recorded at New Lisbon, Ohio, on November 15, 1805 by Bezaleel Wells, a surveyor and devout Episcopalian from Maryland born January 28, 1763. Canton was likely named as a memorial to Captain John O'Donnell, an Irish merchant marine with the British East India Trading Company whom Wells admired. O'Donnell named his estate in Maryland after the Chinese city Canton (a traditional English name for Guangzhou) as he had been the first person to transport goods from there to Baltimore. The name selected by Wells may also have been influenced by the Huguenot use of the word "canton," which meant a division of a district containing several communes. Through Wells' efforts and promotion, Canton was designated the county seat of Stark County upon its division from Columbiana County on January 1, 1809. Among Debs' audience at Nimisilla Park were agents of the U.S. Department of Justice. The year before Debs' speech, and a month following the American entry into the First World War, President Woodrow Wilson signed the Espionage Act of 1917 into law. This Act made it a federal crime to interfere with, among other things, the Selective Service Act or military draft. On June 30, 1918, Debs was arrested and charged with, among other things, “unlawfully, willfully and feloniously cause and attempt to cause and incite and attempt to incite, insubordination, disloyalty, mutiny and refusal of duty, in the military and naval forces of the United States.” Debs' trial began on September 10, 1918 in the U.S. District Court for the Northern District of Ohio. On September 12, 1918, a jury found Debs guilty. He was sentenced to 10 years in prison. On March 10, 1919, the U.S. Supreme Court affirmed the constitutionality of Debs' conviction in Debs v. United States. Debs began serving his prison sentence on April 13, 1919. He and remained incarcerated until September 25, 1921 when he was released after President Warren Harding commuted his sentence to time served. The U.S. Supreme Court's decision affirming Debs' conviction was sharply criticized by legal scholars at the time and is generally regarded as a low-point in First Amendment jurisprudence. While Debs’ speech in Canton and subsequent conviction ultimately aided Debs in delivering the Socialist Party’s antiwar platform, his age and the deleterious effects of prison exhausted his ability as an orator. Debs died of heart failure on October 20, 1926. In June 2017 Canton applied for and received a historic marker from the Ohio History Connection, formerly the Ohio Historical Society, to commemorate Debs' speech at Nimisilla Park and other historic events reflecting the park's importance as a gathering place for the community. The Dueber-Hampden Watch Company was an important employer in Canton during the early 1920s. The Dueber-Hampden Watch Company formally organized in 1923. Previous to this year, the firm actually consisted of two separate companies: the Dueber Watch Case Company and the Hampden Watch Company. In 1886, John Dueber, the owner of the Dueber Watch Case Company, purchased a controlling interest in the Hampden Watch Company. In 1888, he relocated the Hampden Watch Company from Springfield, Massachusetts and the Dueber Watch Case Company from Newport, Kentucky to Canton, Ohio. These two companies shared manufacturing facilities in Canton but remained two separate companies. The Dueber Watch Case Company and the Hampden Watch Company quickly became two of Canton's largest employers. In 1888, the companies' first year in Canton, the firms employed 2,300 Canton residents. In 1890, Canton's population was 26,337 people. Thanks to these two companies, Canton became an important center for watch manufacturing in the United States of America. In 1927 the company went bankrupt, finally ceasing operations in the city in 1930. The machinery and tools were sold to the Amtorg Trading Corporation, one of Soviet Russia’s buying agencies in the US, for $329.000. The company’s massive brick factories, which covered more than 20 acres and included an ornate 150-foot clock tower, were demolished to accommodate the construction of Interstate 77. The Timken Company has been among the largest employers in Canton for nearly 100 years. In 1898, Henry Timken obtained a patent for the tapered roller bearing, and in 1899 incorporated as The Timken Roller Bearing Axle Company in St. Louis. In 1901, the company moved to Canton as the automobile industry began to overtake the carriage industry. Timken and his two sons chose this location because of its proximity to the American car manufacturing centers of Detroit and Cleveland and the American steel-making centers of Pittsburgh and Cleveland. By 1960, Timken had operations in the U.S., Canada, Great Britain, France, South Africa, Australia and Brazil. The company changed its corporate structure in 2014; the roller bearing-producing part of the company was separated from the steel-producing part of the company, resulting in two separate companies. The Timken Company continues to manufacture roller bearings, while TimkenSteel produces steel. Today, TimkenSteel remains headquartered in Canton and employs 2,800 people, most of them in Northeast Ohio. The company makes special bar quality steel, used in applications all over the world. The Timken Co. is now headquartered in Jackson Township, a suburb of Canton, and employs 14,000 people around the world. The company designs, engineers, manufactures and sells bearings, transmissions, gearboxes, chain and related products, and offers a spectrum of power system rebuild and repair services around the globe. On September 17, 1920, a meeting was held at the Hupmobile showroom in the Independent Order of Odd Fellows Building in Canton to found the American Professional Football Association (renamed the National Football League in 1922). The attendees included Ralph Hay, owner of the Hupmobile showroom and the hometown Canton Bulldogs, and George Halas, owner of the Decatur Staleys. Jim Thorpe of the Bulldogs was the league's first president. In 2014 a sculpture titled “Birth of the NFL” was erected in downtown Canton marking the exact location in the Hupmobile showroom where the NFL was created in 1920. On December 6, 1959, the Canton Repository, a newspaper in Canton, called for city officials to lobby the National Football League to create a football hall of fame in the community. Canton officials formally proposed their city as site for the hall of fame in 1961. The NFL quickly agreed to the city's proposal. To help convince NFL officials to locate the hall of fame in Canton, city officials donated several acres of land on Canton's north side to the project. Local residents also raised almost $400,000 to help construct the hall of fame. The Pro Football Hall of Fame formally opened on September 7, 1963. Initially the museum consisted of two buildings, but in 1971, 1978, 1995, and 2013, the Pro Football Hall of Fame experienced several expansions. As of 2013, the museum consisted of five buildings, covering 118,000 square feet. Since its founding, over 10 million people have visited the Pro Football Hall of Fame. This system extends into Stark County but is not shared by the cities of Massillon, Louisville, East Canton or North Canton, which have their own internal address grids. Canton is located at an elevation of 1060 feet (323 m). 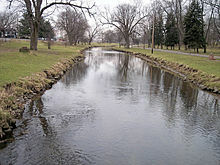 Nimishillen Creek and its East, Middle and West Branches flow through the city. According to the United States Census Bureau, the city has a total area of 25.48 square miles (65.99 km2), of which, 25.46 square miles (65.94 km2) is land and 0.02 square miles (0.05 km2) is water. Canton has a humid continental climate (Köppen climate classification Dfa), typical of much of the Midwestern United States, with very warm, humid summers and cold winters. Winters tend to be cold, with average January high temperatures of 33 °F (1 °C), and average lows of 19 °F (−7 °C), with considerable variation in temperatures. During a typical January, high temperatures of over 50 °F (10 °C) are just as common as low temperatures of below 0 °F (−18 °C). Snowfall is lighter than the snow belt areas to the north. Akron-Canton Airport generally averages 47.1 inches (120 cm) of snow per season. Springs are short with rapid transition from hard winter to summer weather. Summers tend to be warm, sometimes hot, with average July high temperatures of 82 °F (28 °C), and average July low of 62 °F (17 °C). Summer weather is more stable, generally humid with thunderstorms fairly common. Temperatures reach or exceed 90 °F (32 °C) about 9 times each summer, on average. Fall usually is the driest season with many clear, warm days and cool nights. The all-time record high in the Akron-Canton area of 104 °F (40 °C) was established on August 6, 1918, and the all-time record low of −25 °F (−32 °C) was set on January 19, 1994. Canton is the largest principal city of the Canton-Massillon Metropolitan Statistical Area, a metropolitan area that covers Carroll and Stark counties and had a combined population of 404,422 at the 2010 census. In the city the age distribution of the population shows 26.6% under the age of 18, 9.8% from 18 to 24, 29.1% from 25 to 44, 20.2% from 45 to 64, and 14.3% who were 65 years of age or older. The median age was 34 years. For every 100 females, there were 87.5 males. For every 100 females age 18 and over, there were 81.9 males. As of the census of 2010, there were 73,007 people, 29,705 households, and 17,127 families residing in the city. The population density was 2,867.5 inhabitants per square mile (1,107.1/km2). There were 34,571 housing units at an average density of 1,357.9 per square mile (524.3/km2). The racial makeup of the city was 69.1% White, 24.2% African American, 0.5% Native American, 0.3% Asian, 1.0% from other races, and 4.8% from two or more races. Hispanic or Latino of any race were 2.6% of the population. There were 29,705 households of which 31.5% had children under the age of 18 living with them, 30.8% were married couples living together, 21.1% had a female householder with no husband present, 5.7% had a male householder with no wife present, and 42.3% were non-families. 35.4% of all households were made up of individuals and 11.6% had someone living alone who was 65 years of age or older. The average household size was 2.35 and the average family size was 3.04. The median age in the city was 35.6 years. 25.1% of residents were under the age of 18; 10.8% were between the ages of 18 and 24; 25.6% were from 25 to 44; 25.6% were from 45 to 64; and 12.8% were 65 years of age or older. The gender makeup of the city was 47.4% male and 52.6% female. The Canton area's economy is primarily industrial, with significant health care and agricultural segments. The city is home to the TimkenSteel Corporation, a major manufacturer of specialty steel. Several other large companies operate in the greater-Canton area, including Timken Company a maker of tapered roller bearings; Belden Brick Company, a brick and masonry producer; Diebold, a maker of ATMs, electronic voting devices, and bank vaults, and Medline Industries, a manufacturer and distributor of health care supplies. The area is also home to several regional food producers, including Nickles Bakery (baked goods), Case Farms (poultry), and Shearer's Foods (snack foods). Poultry production and dairy farming are also important segments of the Canton area's economy. In recent years, Canton has experienced a very low unemployment rate. The healthcare sector is particularly strong, with Aultman Hospital and Mercy Medical Center among its largest employers. Nevertheless, as in many industrial areas of the United States, employment in the manufacturing sector is in a state of decline. LTV Steel (formerly Republic Steel) suffered bankruptcy in 2000. Republic Steel emerged and continues to maintain operations in Canton. Hoover Company, a major employer for decades in the region reached an agreement to sell Hoover to Hong Kong-based Techtronic Industries. The main plant in nearby North Canton closed its doors in September 2007. On June 30, 2014, the Timken Company and TimkenSteel split, forming two separate companies at the urging of shareholders. The Timken Company relocated to neighboring Jackson Township, while TimkenSteel remains headquartered in Canton. In response to this changing manufacturing landscape, the city is undergoing a transition to a retail and service-based economy. Beginning in the 1970s, Canton, like many mid-size American cities, lost most of its downtown retail business to the suburbs. The majority of the Canton area's "box store" retail is located in the general vicinity of the Belden Village Mall in Jackson Township. However, in recent years, the downtown area has seen significant rejuvenation, with cafes, restaurants, and the establishment of an arts district. A few retail centers remain in Canton at or near the city limits. Tuscarawas Street (Lincoln Way), a leg of the Lincoln Highway connecting Canton with nearby Massillon, is home to the Canton Centre Mall and several retail outlets of varying size. A vein of commerce runs along Whipple Avenue, connecting the Canton Centre area with the Belden Village area. A similar vein runs north from the downtown area, along Cleveland and Market avenues. Connecting Cleveland and Market avenues is a small shopping district on 30th Street NW, and retail lines the Route 62 corridor leading from Canton to Louisville and Alliance. In recent years, Canton has come to experience a renaissance. At the heart of this transformation is the Pro Football Hall of Fame, with its multimillion-dollar "Hall of Fame Village" expansion project. This project has been complemented with significant investments by city leaders in urban redevelopment, which continued with the transformation of the Hotel Onesto into the Historic Onesto Lofts. Other urban renewal plans are underway, which include the redevelopment of the downtown Market Square area. Private investment has furthered Canton's transformation, which is illustrated by the multimillion-dollar creation of the Gervasi Vineyard, which draws patrons throughout the region. In furtherance of these development initiatives, Canton was one of the first cities in Ohio to create a "designated outdoor refreshment area" legalizing the possession and consumption of "open container" alchohlic beverages in its downtown area. The Canton Museum of Art, founded in 1935, is a broad-based community arts organization designed to encourage and promote the fine arts in Canton. The museum focuses on 19th and 20th Century American artists, specifically works on paper, and on American ceramics, beginning in the 1950s. The museum sponsors annual shows of work of high school students in Canton and Stark County, and financial scholarships are awarded. Educational Outreach programs take the museum off-site to libraries, parochial schools, area public schools, five inner city schools and a school for students with behavioral disorders. The city's Arts District, located downtown, is the site of monthly First Friday arts celebrations. Canton's K-12 students are primarily served by the Canton City School District, although students north of 17th Street NW have an overlap with Plain Local School District. Canton Local School District serves the better part of Canton South. Malone University, a private, four-year liberal arts college affiliated with the Evangelical Friends Church, is located on 25th Street NW. Catholic-run Walsh University is located nearby in North Canton. Stark State College and a branch of Kent State University are also nearby, in Jackson Township. Also, in downtown Canton, there is a small annex for Stark State College to be used by the Early College High School students who are located on the Timken Campus. Catholic grade schools within the city limits of Canton are St. Peter, St. Joseph, and Our Lady of Peace. Additional Catholic schools in the Canton area include Canton St. Michael School, ranked first in the Power of the Pen state tournament in 2010, and Canton St. Joan of Arc School. There is also Heritage Christian School (K-12), a Christian grade school and high school. Canton Country Day School is a private PreK-8 school located just outside city limits in nearby Plain Township. Within the city limits is the private Canton Montessori School, which teaches according to the Montessori Plan for education proposed by Maria Montessori in the early 20th century. Canton has the main branch of Stark County District Library. Canton is part of the greater Cleveland television media market. However, due to its proximity to Youngstown, it is common for residents to receive stations from that area. There are also three television stations that are licensed to Canton, though none of them are major network affiliates. Canton also has a cable Public-access television channel, Canton City Schools TV 11. The content varies based on the viewer's location. Citizens located in North Canton will see North Canton's programming instead of Canton City's. Those within the borders of Plain Local Schools will see Eagle Television's programming. Front entrance to the Pro Football Hall of Fame. Canton is home to the Pro Football Hall of Fame. The American Professional Football Association, the forerunner of the NFL, was founded in a Canton car dealership on September 17, 1920. The Canton Bulldogs were an NFL football team that played from 1920–1923 skipped 1924 season then played 1925 to '26 before folding. Every summer, Canton is the home of the Pro Football Hall of Fame Enshrinement Festival, which includes a hot air balloon festival, ribs burn-off, fashion show, community parade, Sunday morning race, enshrinee dinner, and the Pro Football Hall of Fame Grand Parade. The festival culminates in the enshrinement of the new inductees and the NFL/Hall of Fame Game, a pre-season exhibition between teams representing the AFC and NFC at Tom Benson Hall of Fame Stadium. Tom Benson Hall of Fame Stadium, used during the regular season by Canton McKinley High School (as well as some other area schools and colleges), was rated the number one high school football venue in America by the Sporting News in 2002. This may be partly attributable to the Bulldogs' rivalry with the nearby Massillon Washington High School Tigers, which is regarded as one of the best rivalries in all of high school football. Three of the Ohio High School Athletic Association state final football games are hosted in Canton at Tom Benson Hall of Fame Stadium. The other three take place in nearby Massillon, Ohio, at Paul Brown Tiger Stadium. The Canton Legends played in the American Indoor Football Association at the Canton Civic Center. Operations were suspended in 2009. The Continental Indoor Football League also has offices in Canton. The first official female bodybuilding competition was held in Canton in November 1977 and was called the Ohio Regional Women's Physique Championship. Canton is also home to an NBA G League team, the Canton Charge, which started play with the 2011–12 season. The Cleveland Cavaliers have full control over the team. The Charge play their home games at the Canton Memorial Civic Center. The Canton Invaders of the National Professional Soccer League II and American Indoor Soccer Association played home games at the Canton Memorial Civic Center from 1984 until 1996, winning five league championships. In 2009, the Ohio Vortex became an expansion team in the Professional Arena Soccer League. Operations have since been suspended. Canton has been home to professional baseball on several occasions. A number of minor league teams called Canton home in the early 1900s, including the Canton Terriers in the 1920s and '30s. The Canton–Akron Indians were the AA affiliate of the major league Cleveland Indians for nine years, playing at Thurman Munson Memorial Stadium until the team relocated north to Akron following the 1996 season. Two independent minor league teams, the Canton Crocodiles and the Canton Coyotes, both members of the Frontier League, called Munson Stadium home for several years afterward. The Crocodiles, who won the league championship in their inaugural season in 1997, moved to Washington, Pennsylvania, in 2002, and the Coyotes moved to Columbia, Missouri, in 2003, after just one season in Canton. Canton is home to the Bluecoats Drum and Bugle Corps, a world class competitor in Drum Corps International. The Bluecoats have been a part of the "top five" finalists in the DCI World Championships since 2013, and took home the Founders' Trophy in 2016, with their show entitled "Down Side Up". Canton is connected to the Interstate Highway System via Interstate 77 which connects Canton to Marietta, Ohio, and points south, and to Cleveland and Akron, Ohio, to the north. U.S. Route 30 connects Canton to Wooster, Ohio, and points west, and to East Liverpool, Ohio, and points east. U.S. Route 62 connects Canton to Millersburg, Ohio, and points southwest, and to Youngstown, Ohio, and points northeast. Norfolk Southern and the Wheeling-Lake Erie railroads provide freight service in Canton. Stark Area Regional Transit Authority (SARTA) provides public transit bus service within the county, including service to Massillon, the Akron-Canton Regional Airport, and the Amtrak station located in Alliance. ^ Mayor: City of Canton Retrieved January 2, 2007. ^ a b "Annual Estimates of the Resident Population for Incorporated Places of 50,000 or More, Ranked by July 1, 2017 Population". United States Census Bureau. US Census Bureau, Population Division. May 2018. Retrieved 12 March 2019. ^ "Driving Directions from Canton, Ohio to Cleveland, Ohio". Mapquest. June 5, 2007. Retrieved June 5, 2007. ^ "Census shows sharp population decline in Canton". CantonRep.com. Archived from the original on March 12, 2011. Retrieved March 11, 2011. ^ Matas, Alison (2016-09-06). "Construction of apartments underway at Hercules site in Canton". The Repository. Retrieved 2016-12-02. ^ Wang, Robert (2016-06-03). "City officials, First Friday attendees kick off outdoor refreshment district". The Repository. Retrieved 2016-12-02. ^ Henderson, Time (2016-10-28). "To Enliven Downtowns, Some Cities Promote Public Drinking". The Huffington Post. Retrieved 2016-12-02. ^ "cantonrep.com". 2007-03-10. Archived from the original on 2007-03-10. Retrieved 2018-04-03. ^ "Canton | Ohio, United States". Encyclopædia Britannica. Retrieved 2019-02-16. ^ Heald, Edward (1948). "Bezaleel Wells Founder of Canton and Steubenville, Ohio". www.digitalshoebox.org. Retrieved 2019-02-16. ^ "The Front Porch Campaign | AMERICAN HERITAGE". www.americanheritage.com. Retrieved 2019-02-16. ^ "Free Speech on Trial". National Archives. 2018-05-16. Retrieved 2019-02-16. ^ "Debs v. United States, 249 U.S. 211 (1919)". Justia Law. Retrieved 2019-02-16. ^ Kalven, Harry (1973). "Ernst Freund and the First Amendment Tradition - Professor Ernst Freund and Debs v. United States". University of Chicago Law Review. 40: 235. ^ "Nimisilla Park to receive historic marker". The Repository. Retrieved 2019-02-16. ^ "Dueber-Hampden Watch Company - Ohio History Central". www.ohiohistorycentral.org. Retrieved 2019-02-16. ^ Hoover, Shane. "1930: Canton watchmakers, wives started Russian watch factory". The Repository. Retrieved 2019-02-16. ^ "Timken Company - Ohio History Central". www.ohiohistorycentral.org. Retrieved 2019-02-16. ^ Pritchard, Edd. "TimkenSteel launches a new era in Canton". The Repository. Retrieved 2019-02-16. ^ "Made in America for More than 100 Years". TimkenSteel. Retrieved 2019-02-16. ^ "The Timken Company | Bearings & Mechanical Power Transmissions". The Timken Company. Retrieved 2019-02-16. ^ Botos, Tim. "Stark Heritage: The Timken name and its tremendous impact on county history". The Repository. Retrieved 2019-02-16. ^ Klein, Christopher. "The Birth of the National Football League". HISTORY. Retrieved 2019-02-18. ^ Lisko, B. J. "'Birth of the NFL' statue unveiled". The Repository. Retrieved 2019-02-16. ^ "Pro Football Hall of Fame - Ohio History Central". www.ohiohistorycentral.org. Retrieved 2019-02-16. ^ "History of the Pro Football Hall of Fame - Visit | Pro Football Hall of Fame Official Site". www.profootballhof.com. Retrieved 2019-02-16. ^ "Pro Football Hall of Fame Welcomes 10 Millionth Visitor | Pro Football Hall of Fame Official Site". www.profootballhof.com. Retrieved 2019-02-16. ^ "Geographic Names Information System entry for Canton". Retrieved January 13, 2007. ^ "CantonRep.com – Canton and Stark County News". Archived from the original on 2007-09-27. Retrieved 2007-01-13. ^ "Weatherbase: Historical Weather for Akron, Ohio". Retrieved November 10, 2008. ^ a b "NowData – NOAA Online Weather Data". National Oceanic and Atmospheric Administration. Retrieved 2013-11-24. ^ Metropolitan Statistical Areas and Components Archived May 26, 2007, at the Wayback Machine, Office of Management and Budget, May 11, 2007. Accessed 2008-07-30. ^ "Office of the Mayor of the City of Canton". cantonohio.gov. Retrieved 2019-02-15. ^ "William Sherer II, President of Canton City Council". cantonohio.gov. Retrieved 2019-02-15. ^ "James Babcock, Canton City Council". cantonohio.gov. Retrieved 2019-02-15. ^ "Corey Minor Smith, Canton City Council". cantonohio.gov. Retrieved 2019-02-15. ^ "Bill Smuckler, Canton City Council". cantonohio.gov. Retrieved 2016-12-02. ^ "Greg Hawk, Canton City Council". cantonohio.gov. Retrieved 2016-12-02. ^ "Nate Chester III, Canton City Council". cantonohio.gov. Retrieved 2019-02-15. ^ Department, City of Canton, I.T. "Jason Scaglione, Canton City Council". cantonohio.gov. Retrieved 2019-02-15. ^ "Chris Smith, Canton City Council". cantonohio.gov. Retrieved 2019-02-15. ^ "Robert Fisher, Canton City Council". cantonohio.gov. Retrieved 2019-02-15. ^ "Kevin D. Hall, Canton City Council". cantonohio.gov. Retrieved 2019-02-15. ^ "John Mariol II, Canton City Council". cantonohio.gov. Retrieved 2019-02-15. ^ "Peter Ferguson, Canton City Council". cantonohio.gov. Retrieved 2019-02-15. ^ "Frank Morris, Canton City Council". cantonohio.gov. Retrieved 2019-02-15. ^ "Richard A. Mallon II, Auditor of the City of Canton". cantonohio.gov. Retrieved 2019-02-15. ^ "City of Canton Income Tax Department". www.cantonincometax.com. Retrieved 2019-02-15. ^ "Kristen Bates Aylward, Law Director of the City of Canton". cantonohio.gov. Retrieved 2019-02-15. ^ "Senator Kirk Schuring (R) - District 29 | The Ohio Senate". ohiosenate.gov. Retrieved 2019-02-15. ^ "Representative Thomas D. West (D) - District 49 | The Ohio House of Representatives". www.ohiohouse.gov. Retrieved 2019-02-15. ^ "Home | United States Senator Sherrod Brown". www.brown.senate.gov. Retrieved 2016-12-02. ^ "Rob Portman". www.portman.senate.gov. Retrieved 2016-12-02. ^ "Congressman Bob Gibbs". Congressman Bob Gibbs. Retrieved 2016-12-02. ^ "Congressman Anthony Gonzalez". House.gov. Retrieved 2019-02-16. ^ Canton Comprehensive Plan (PDF). The City of Canton. 2016. ^ "Local jobless rate remains low in November". The Repository. Retrieved 2016-12-02. ^ Pritchard, Edd (June 30, 2014). "Canton Repository". Retrieved Oct 2, 2014. ^ "Pro Football Hall of Fame trustees approve master plan for 'Hall of Fame Village'". 11 November 2014. Retrieved 3 March 2017. ^ report, CantonRep.com staff. "Canton City Council to vote on tax break for Onesto". Retrieved 3 March 2017. ^ Matas, Alison. "Plans for Market Square get preliminary OK from council". Retrieved 3 March 2017. ^ "Ohio Winery and Italian Restaurant - Gervasi Vineyard Canton Ohio - Dining and Inn Hotel". Retrieved 3 March 2017. ^ Wang, Robert. "City officials, First Friday attendees kick off outdoor refreshment district". The Repository. Retrieved 2016-12-02. ^ Henderson, Tim; Policy (2016-10-28). "To Enliven Downtowns, Some Cities Promote Public Drinking". The Huffington Post. Retrieved 2016-12-02. ^ "City of Canton CAFR 2017" (PDF). ^ "Locations". Stark County District Library. Retrieved 3 March 2018. ^ "Pro Football Hall of Fame Enshrinement Festival | Canton, Ohio". www.profootballhoffestival.com. Retrieved 2016-12-02. ^ "Fawcett Stadium history". Times Reporter. 2015-06-02. Retrieved 2016-12-02. ^ Montville, Leigh (1994-11-14). "The Centurians". SI.com. Retrieved 2016-12-02. ^ Lowe, Maria R. (1 January 1998). Women of Steel: Female Bodybuilders and the Struggle for Self-definition. NYU Press. ISBN 9780814750940. Retrieved 3 March 2017 – via Google Books. ^ "Home - Canton Charge". Canton Charge. Retrieved 2016-12-02. ^ "Who are the Bluecoats?'". Retrieved 29 November 2017. ^ "Recap Roundup: 2016 DCI World Championship Finals'". Drum Corps International. 14 August 2016. Retrieved 29 November 2017. ^ a b Gumbrecht, Jamie (July 23, 2008). "Colbert's 'crappy Canton' comment puzzles mayor". The Atlanta Journal-Constitution. ^ "Stephen Colbert slams Canton, Kansas". Kansas City Star. July 31, 2008. In "apologizing" to Canton, Ga., on Wednesday's "The Colbert Report", Stephen Colbert slammed Canton, Kan.
^ "Google maps goof calls Canton, Ohio, 'Colesville'". Arizona Daily Star. Associated Press. October 27, 2009. Archived from the original on July 18, 2012. Retrieved November 8, 2009. ^ Pritchard, Edd (October 27, 2009). "Mr. Wells called it Canton, Google calls it Colesville". The (Canton) Repository. Archived from the original on October 31, 2009. Retrieved November 8, 2009. Folks at Google offices in California already have heard rumors that the name change somehow is related to the McKinley-Massillon football game this weekend. That's not the case, Filadelfo said several times. "It's simply an error when the map was being labeled", she said. 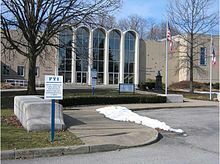 Wikimedia Commons has media related to Canton, Ohio. Wikivoyage has a travel guide for Canton, Ohio. Wikisource has the text of the 1911 Encyclopædia Britannica article Canton (Ohio). This page was last edited on 26 March 2019, at 15:32 (UTC).